There’s no reason you can’t be both a cruiser and a racer. Better yet, you don’t need to have a two boat program either. Quantum’s Jay Sharkey details how to optimize your current boat to make you competitive in the performance cruising circuits. Everyone loves to sail fast, even the hard-core cruiser. When the racing bug bites and it’s time to dip your toe in the local race circuit, there are hundreds of thousands of sailboats marketed as dual-purpose racer/cruisers that fill marinas around the world. 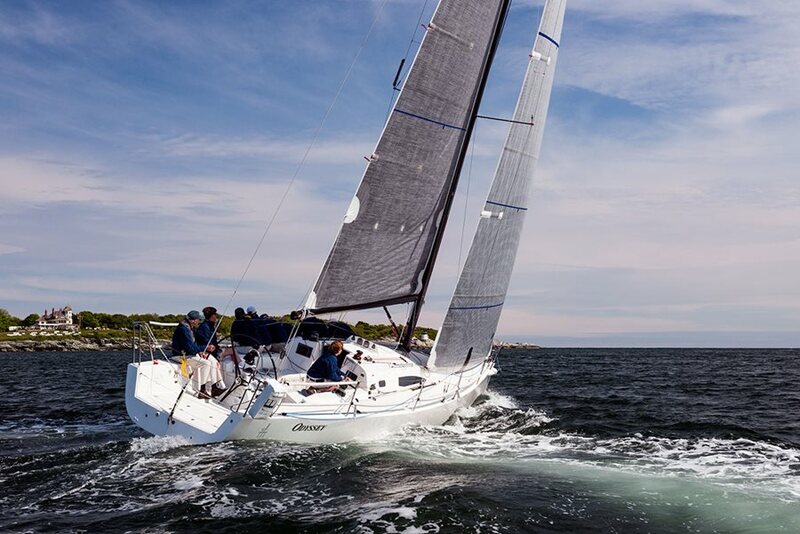 These boats tend to be neither overbuilt offshore passage-makers, nor stripped-out high-tech racing machines, but they can fill both roles for most sailors’ needs. However, there’s no need to trade in your trusty cruiser or buy a second boat, there are a number of things you can do to optimize your current boat to be competitive in performance cruising circuits and still be able to enjoy a comfortable sunset sail. Whether it’s your current cruising boat or a new racer/cruiser, they can be optimized for racing or cruising without huge expenses or modifications. In this piece, we’ll examine the racing part of the equation and how to best set up your boat for the racecourse. As a sailmaker, the most obvious place to start is with a new set of sails. Many cruiser/racers today come with OEM sails. Being a line item that affects the overall cost of the boat, these OEM sails are usually inexpensively constructed out of cross-cut Dacron panels (the standard since the Nina raced the Pinta and Santa Maria across the Atlantic). Not much consideration is given to their use. These low-tech sails tend to lose their shape after a few years. Even though they appear to be working, they lose efficiency, keeping the boat from performing at its full potential. The most common upgrade is to a radial sail. The design technique allows sail designers to save sail weight by assembling them in a way that orients the sailcloth to the direction of the loads, allowing for less material use in the “unloaded” direction. Radial sails also have more shapeable panels in their construction, giving the designer more room to fine-tune the finished flying shape. At the high-end of the technology scale are Membrane (“string”) sails, such as Quantum’s Fusion M™ product line, where the sails are custom-engineered for the load paths. Fusion M™ sails are built for both racing and cruising applications with options such as double-sided taffetas and light-skin laminates to increase their longevity and long-term shape retention. Upgrading your sail inventory is just the first step. You may need to make other modifications to take full advantage of your new sails’ performance. Higher-tech sails stretch less than the cross-cut Dacron variety, so it’s important to make sure the lines controlling them are as equally stretch resistant. Along with sails and rigging, optimizing your electronics will help you improve your racing performance. The most basic modern electronics package will usually have the essentials: wind speed/direction and boat speed. Make sure your electronics are calibrated accurately, and familiarize yourself with the wind-speed functions to track wind shifts as you’re racing. Boat speed is important, not only because of the obvious “how-fast-are-we-going,” but also because it allows you to use polar diagrams (VPP charts, usually available from the designers) to compare how fast you should be going to how fast you’re actually going at a certain wind speed and angle. Finally, the boat itself can be optimized for racing with a few tweaks: lightening your boat as much as possible is the cheapest and easiest first step, just make sure not to violate any rules about removing standard equipment like locker doors and cushions. Remove all extra tools, spares, and any other items you won’t need to race (investing in a dock-box will give you a place to store things, like your barbeque and water toys, while you race for the day). Make sure all water tanks are empty. Stow all gear as close to the middle of the boat and as far down as possible. If you have a fixed propeller, switching to a folding prop will also make a big difference (at the expense of maneuverability under power), as will fairing the keel and rudder. The idea is that the smoother the flow across the bottom, the faster the boat will go. Taking the leap from cruising into racing doesn’t have to be intimidating. By following these steps, you’ll see a definite jump in your boat’s performance. Now comes the fun part – get out there and mix it up! Good luck, and welcome to your new addiction: sailboat racing! Editor’s Note: There’s no better place to race in January than Quantum Key West Race Week with the new Performance Cruising Division. Get planning tips from our experienced team members and take advantage of our fall special which covers your entry fee and free sail shipping to Key West with a new sail purchase. Contact your local sail consultant for full details.